Quire 1 is a standard quire of four bifolios, containing folios 1 through 8. The quire mark (Pmus) is on f8v. 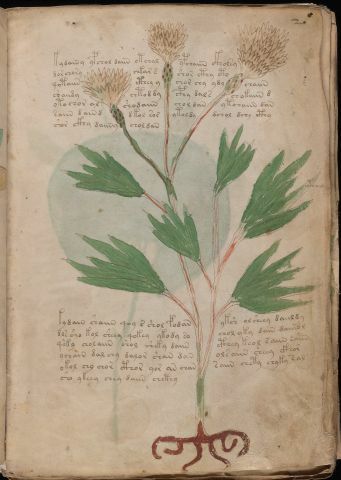 There is one text-only page (f1r) and all other pages have herbal drawings. Folio 1, together with folio 8 form a standard-sized bifolio. The folio nr. of folio 1 is on f1r. Folio 1 is strongly affected by insect holes, particularly in locations near the edges of the old binding. This is the first page in the MS and it appears more worn then most other pages. It is a text-only page with four paragraphs of text, and there is additional writing by later owners. Folio nr (1) in upper right corner. There are several cases of writing by later owners on this page, notably the ex libris of Jacobus de Tepenec. 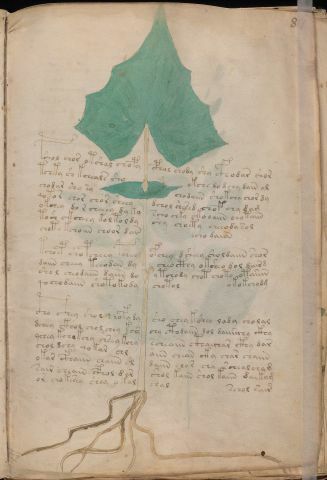 The stains on this page are from several causes: Voynich and Brumbaugh both describe how they applied chemicals to this page, and there are also imprints of a previous tanned leather cover. 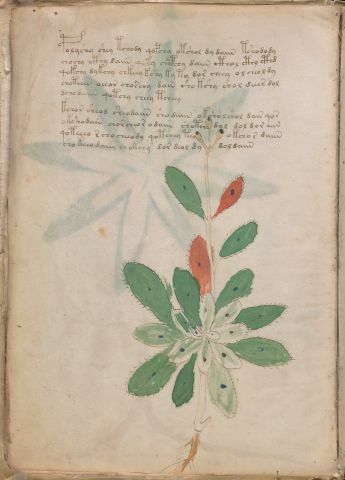 While the page has no significant illustrations, there are three red so-called "doodles" which have been drawn in the same way as the illustrations in the MS, namely with outline drawings in ink, and afterwards painted in red. They are further discussed under the heading 'Text'. There are 24 lines of text, subdivided into four paragraphs. Each paragraph ends with one or two right-justified words (sometimes referred to as 'titles'). 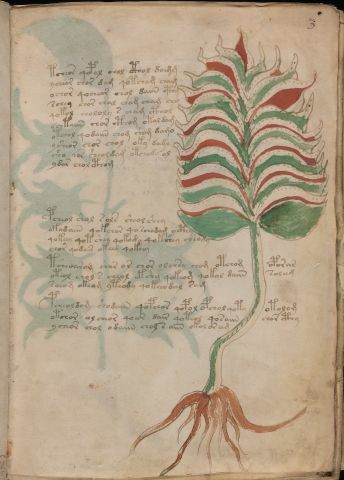 Paragraphs 2 and 3 have large initials (coloured red) which are not part of the Voynich alphabet. The two symbols are drawn or painted with flaring strokes ending in swallowtail serifs. The right margin is badly stained. The text in the right margin shows three columns of letters. The first column has a through z in a lower case italic hand (< Reeds). The presence of every letter could not be confirmed, but a, b, c, ... o, p, q, r, s, ... y, z are pretty clear. 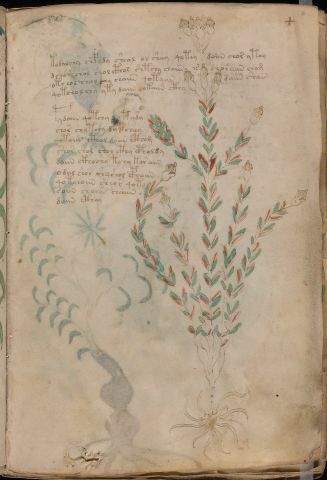 Next to those are very spotty fragments of Voynich letters. Jim Reeds could make out d next to a, r next to c, g next to y, and one of the gallows letters somewhere near the q, r, s range. The third column seems to be 1 off from the first: italic miniscules, r next to s, and so on. Th.Petersen copies some of them in his hand transcription, but more is visible in the UV shots. I personally believe that the second Latin alphabet could be in a different hand than the first. The folio number is not very clearly visible and there is another red mark vaguely looking like 29 below it. Brumbaugh further reports seeing some numbers in the upper right corner of f1r before it was obliterated by the application of chemicals (intended to reveal faded writing). The bottom margin of f1r contains the ex libris: Jacobj a Tepenece, visible under UV light. This is discussed in more detail on a dedicated page. 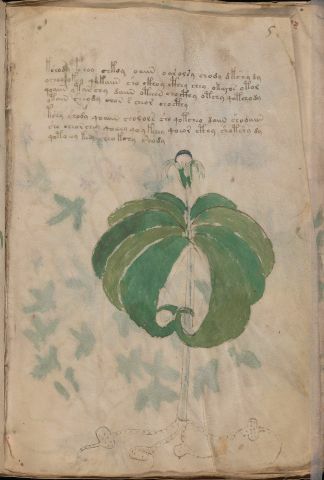 Voynich reports seeing illegible characters below this name. Brumbaugh reports that below the signature is the word "Prag" In reality, it says 'No 19' (number not entirely certain). The page layout suggests four quotes with attributions, or signed endorsements. It is assumed that this page was also originally meant to be the MS first page. The four paragraphs could perhaps represent a summary of the contents of the MS. The first red doodle looks like the old-style (Greek) Aries symbol. 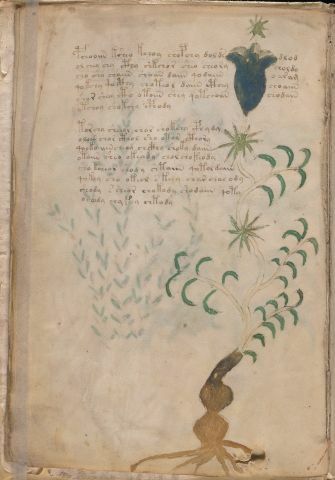 It is very similar to such a symbol in an illustration of an old greek Ms. The second doodle is vaguely similar to the first one and has also been compared to a Chinese character. A more recent view suggests that these are topic markers, and as such they are found also in other MSs. The character tables in the right margin are possibly an attempt by one of the later owners to decipher the alphabet. Brumbaugh also mentions the year 1*30 being written above the alphabet, and favours the theory that it is 1630, written by the owner prior to Marci. This is no longer legible, even under UV illumination. The ex libris of Jacobus de Tepenec is a clear indication that he once owned the book, even though the name may possibly have been written by someone else. The 'No 19' below it is a common feature of all books once owned by Jacobus de Tepenec, or at least the six that have currently been identified (see the biographies page). There is some speculation about why it should have been erased and who would have erased it (or whether it has simply faded). This is a herbal page. For general information about herbal pages see here. One plant centered on page. Root: a knobby, warped, pancanke-like tuber with short roots attached like claws or fangs all around the rim. Light color. Stem: thick, well drawn. Light color. Branches: one straight up, two oblique with drooping tips. Leaves: broad lance-shape, with two short tails. Flowers: one, growing at the tip of the center branch. Stalk: very short. Chalyx: conical, continuous with petals. Petals: short rounded, light-colored. Core: hemispherical, dark-colored. There are ten lines of text subdivided into two paragraphs, left and right of the stem. 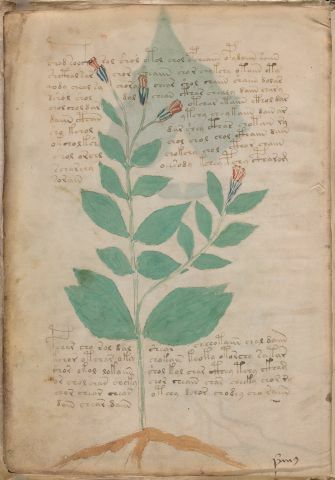 Possible plant identification: uva lupi, atropa belladonna, solatrum d[iv|w]ale, Ref: Fuchs p.398 (according to Th.Petersen). This could be a berry according to Stolfi. 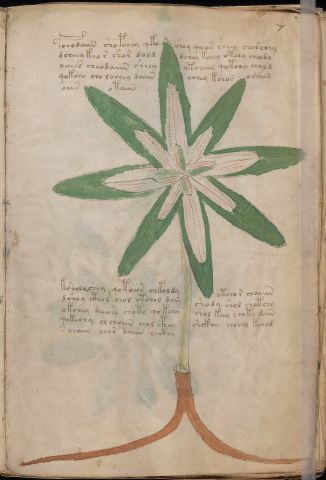 A part of the same plant (same roots) reappears in the Pharma section, on f102r1 (item 204). Folio 2, together with folio 7 form a standard-sized bifolio. The folio nr. of folio 2 is on f2r. Folio nr. (2) in upper right corner. 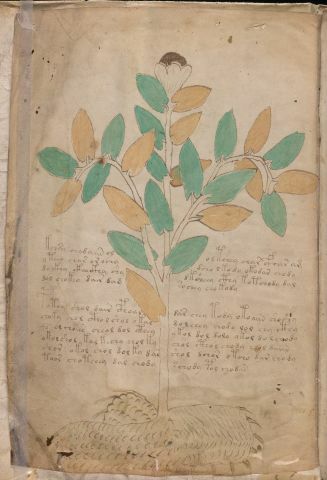 A page-filling plant drawing. Small roots, a stem with leaves and flowers with dotted bulbs below them. 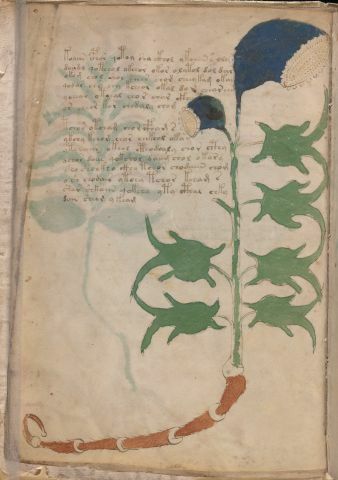 There are 13 lines of text subdivided into two paragraphs, one near the top of the page and carefully avoiding the flowers and the other one near the bottom, on either side of the stem. The plant has a label. There are 8 lines of text, subdivided into two short paragraphs. This has often been compared with a water lily, but the flower is not a good representation of a water lily, and looks much more like a normal lily. Of water flowers, it looks more like Nymphoides Peltata (yellow floating heart) The 'root' is an accurate rendition of a water lily. Folio 3, together with folio 6 form a standard-sized bifolio. The folio nr. of folio 3 is on f3r. Folio nr. (3) in upper right corner. Plant has stem with closely stacked leaves. There are 20 lines of text, subdivided into four paragraphs. There is a large gap between the first and second paragraph. Plant with 'telescope' roots, frog-like leaves and pods. There are 14 lines of text subdivided into two paragraphs. Folio 4, together with folio 5 form a standard-sized bifolio. The folio nr. of folio 4 is on f4r. Folio nr. (4) in upper right corner. Plant with lots of tiny leaves and small flowers. There are 13 lines of text subdivided into two paragraphs. Plant with tiny leaves and apparently two types of flowers. Bulging stem above nondescript roots. Folio 5, together with folio 4 form a standard-sized bifolio. The folio nr. of folio 5 is on f5r. Folio nr (5) in upper right corner. Plant drawing using primarily green. There are 7 lines of text subdivided into two short paragraphs. Plant stem has impossible(?) 'loop'. Six lines of text in a single paragraph. Folio 6, together with folio 3 form a standard-sized bifolio. The folio nr. of folio 6 is on f6r. Folio nr (6) in upper right corner. Plant drawing using mainly green. Thee are four pods each with a patch as if they are decaying. There are 14 lines of text in a single paragraph. 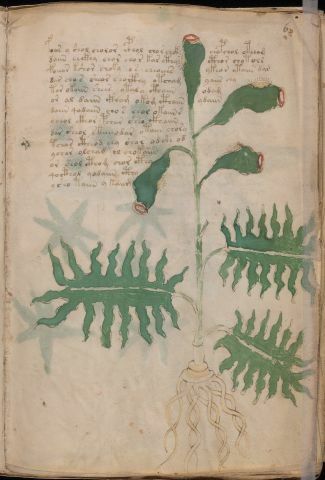 Plant has leaves similar to those on f51r. Plant drawing using mainly green and some blue. 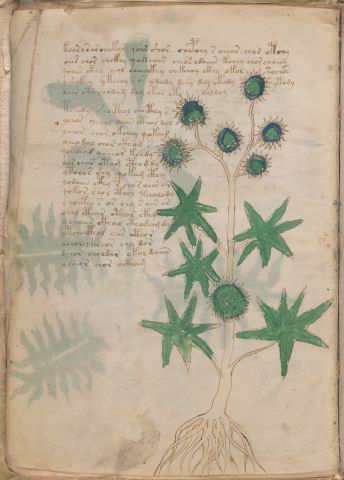 Leaves are 7-pointed stars, and 'fruits' have spikes. There are 21 lines of text subdivided into two paragraphs. The second paragraph has short lines due to the presence of the drawing. This is one of the herbal drawings that looks like a realistic rendition of a known herb, in this case Ricinus. Folio 7, together with folio 2 form a standard-sized bifolio. The folio nr. of folio 7 is on f7r. Folio nr (7) in upper right corner. Page-filling flower with 8-fold symmetry, short stem and simple bifurcating roots. 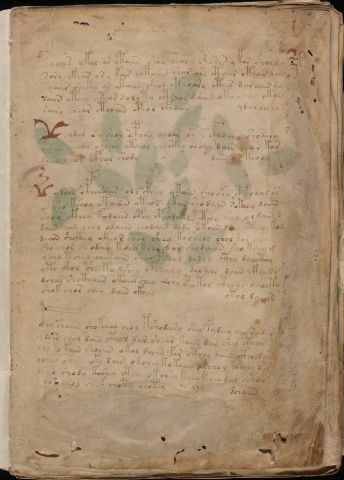 There are 10 lines of text subdivided into two paragraphs, one near the top of the page and the other below the plant. Both are avoiding the drawing. Despite the size of the drawing, this could well be just a small plant. A herb with blue dots on the leaves. There are 9 lines of text in two paragraphs near the top of the page. The plant intrudes in the second paragraph. Folio 8, together with folio 1 form a standard-sized bifolio. The folio nr. of folio 8 is on f8r. The quire number (Pmus) is on f8v. Folio nr (8) in upper right corner. 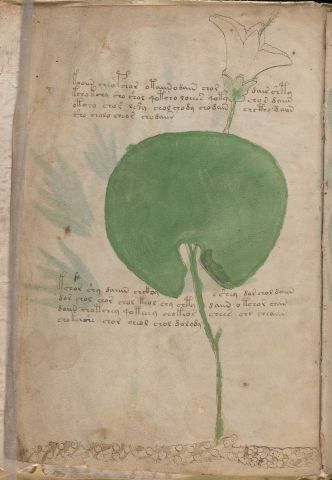 The herb drawing shows a single large leaf with some additional part below it. There are 18 lines of text in three paragraphs. All three end with one word (signature) in right margin (as on f1r). The quire mark 'Pm9' is in the lower right corner of this page. 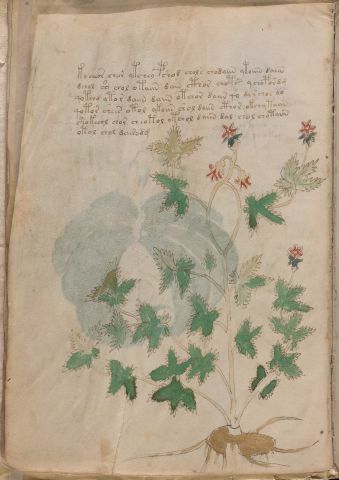 Large plant drawing with plain roots, plain leaves, and blue and red flowers. There are 17 lines of text in two paragraphs. Both carefully avoid the plant drawing.